Cox Communications (Tucson)CenturyLinkRentDynamicsAnyone Home, Inc. Depending on who you ask, roughly 70 – 75% of renters own pets. Communities with anti-pet policies, therefore, are deterring a large portion of highly qualified renters. Opening your doors to pets can have a great impact on your business! You will attract more renters and get a great ROI from the pet policies and fees you charge. However, certain precautions and preparation must be taken to make your property pet friendly. 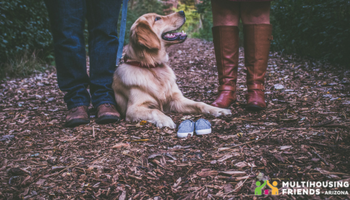 One of the most important aspects of a pet friendly community is creating the proper rules and regulations regarding pets. Zillow recommends that you first speak to your insurance company to learn about any restrictions or disclaimers they may have about renting to people with pets. Next you should create provisions in your lease regarding pets. The purpose of pet provisions is to protect your company and ensure that renters know the rules they must follow with their pets. Let them know about their responsibilities and liabilities should problems occur due to their pets. Many properties charge pet owners with a refundable pet security deposit, a monthly pet fee or both. This helps to protect you from any possible damages that pets may incur. It is important to remember that under the Fair Housing Act service and assistance animals are not considered to be pets, so your restrictions for pets or any pet deposits/fees are not applicable in such cases. Apartment units typically don’t provide much room for active animals, so it may be wise to invest in space where pets can walk and run. In our article “Pet Friendly is Business Friendly,” we mentioned that pet related amenities often result in the best ROI compared to other amenities. They are also among the lowest cost amenities to implement. Consider developing walking trails, fenced-in dog parks, pet washing/grooming stations, etc. in order to provide renters will all the resources they need to properly care for their furry friends. Apartment units are often where property managers fear pets will cause the most damage. Fortunately, a few tweaks can be made to withstand the wear and tear of pets. Apartment Therapy recommends that two of the best furniture upholsteries for cats and dogs are microfiber and leather. Cats don’t enjoy scratching these materials as much and if scratches do appear, they can typically be removed without much difficulty. Odors don’t stick to these materials as easily and debris such as dirt and hair can be easily wiped off (such debris is also less likely to stick to microfiber and leather). Carpet is infamous for retaining odors and just about everything else pets might leave behind. Save yourself some trouble and install vinyl or hardwood floors in your units. Any messes that pets make on such flooring can be effortlessly cleaned up. Your renters will also appreciate the switch because they won’t have to give up their security deposit – at least for a carpet cleaning fee. Take a look at your units and find out how to pet-proof them. Your creative solutions may just attract even more pet lovers to your property.